It should be no surprise that Greece boasts a wide array of historical sites and museums. Greece’s top museums offer an interesting insight into the country’s rich past, its culture and customs. Discover some of the top museums to check out in Greece. There is no better way to plunge into the unique world of ancient Athens than to visit the Acropolis Museum. Admire priceless artifacts found on the sacred rock of the Acropolis, dating back from the Mycenaean period (1600-1100 BCE) and early Christian times. Displayed in a spectacular and impressive building, the multi-level museum features an entire gallery of statues with glass walls, allowing visitors to admire the exhibits in natural light. 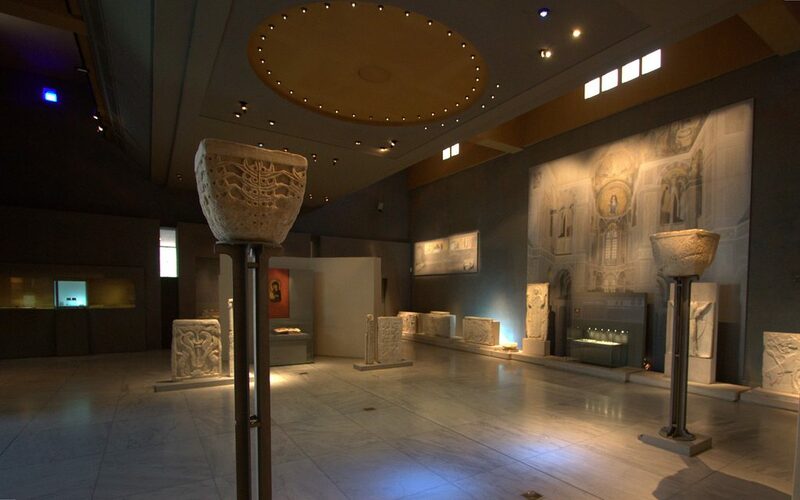 One of the largest museums of Greece, the Archaeological Museum of Thessaloniki is the central museum of northern Greece. Retracing the entire history of the Macedonia region, the permanent collections include unique exhibits of ancient Greek art from the prehistoric period to late antiquity, collected from sites dotting Macedonia. 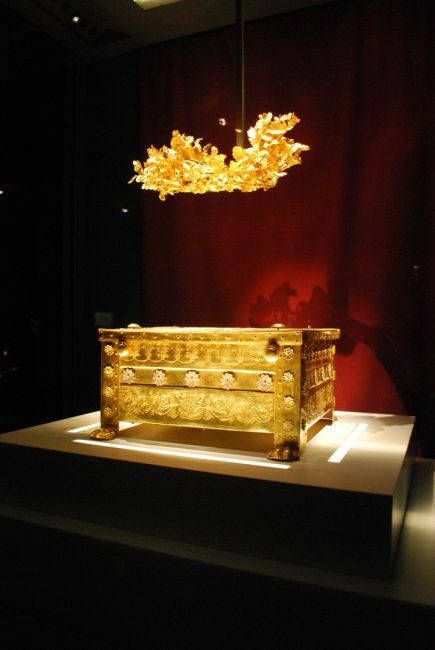 Visitors can also admire a large collection of golden Macedonian crowns, and the Derveni krater, which depicts the union of Dionysus and Ariadne. Located near the Archaeological Museum (above), the Museum of Byzantine Culture is an exquisite place dedicated to the Byzantine era, including early Christian, Byzantine and post-Byzantine art. The museum also has exhibits of an early Christian (or paleochristian) settlement, and provides insight into the daily life, houses, food, clothing and even cemeteries of the time. Santorini is more than just a volcanic island with Instagram-worthy villages on the caldera and dramatic beaches. It is also home to the Museum of Prehistoric Thera (or Fira), where one can admire finds excavated from the Minoan settlement of Akrotiri and Potamos. Revel in the beauty of age-old frescoes and artifacts dating from the Neolithic and Cycladic periods, as well as wall paintings and rare everyday objects from the distant past. 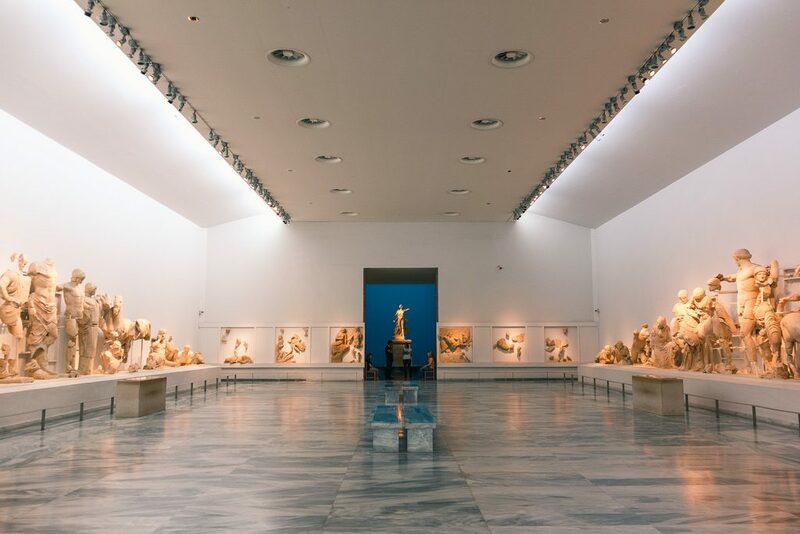 One of the largest museum in the country, the National Archaeological Museum was set up to house finds excavated in and around Athens, and was extended to welcome finds from all over the nation. It holds more than 11,000 exhibits that show a wide panorama of Greek civilization, from prehistory to late Antiquity. The museum is also home to an Egyptian and Near Eastern Antiquities collection, which spans from 5000 BCE until the Roman Empire. The splendid Archaeological Museum of Delphi is considered one of the most important in Greece, given the reputation of the sanctuary during Antiquity. Home to the most famous oracle of Ancient Greece, Delphi and its museum boasts a unique collection of sculptures and statues found in the sanctuary that reflect the various activities that happened there, as well as the many treasures donated to the sanctuary. Often overlooked, the Museum of the Royal Tombs of Aigai in Vergina lies at the foot of Mount Pieria. While the site includes open-air ruins, the underground museum/cemetery is a must-see. There you will be able to explore perfectly protected tombs that house treasures from the Macedonian civilization, including frescoes, gold jewelry, mosaics and ancient items. Past the dark museum entrance in the tumulus is a small temple built for Phillip II of Macedon, father of Alexander the Great. This unique setting, where visitor can view archaeological finds within their context, allows for a memorable experience. Just when you thought Greece was only about ancient ruins and marble temples, the little Museum of Modern Greek Art offers a refreshing change. Home to a small collection of paintings, sculptures, engravings and prints by 19th and 20th century Greek artists, the museum was set up to depict the history of art in Greece. It’s an ideal place to visit if you’ve had an overdose of ancient history. This underrated museum takes you on a journey into Cycladic culture. More ancient than Sparta or even Athens, Cycladic art (3200-2000 BCE) is characterized by small, simple and abstract marble figurines and ancient artifacts. The museum also includes an Ancient Greece collection, as well as Cypriot Antiquities, mostly made of stone, silver, bronze, gold, faience and clay. Prolong your visit with a delicious lunch in the luminous museum cafeteria. Interested in the Minoan civilization? Then your best bet is to head straight to the Herakleion Archaeological Museum, which includes an extensive collection of Minoan art and representative artifacts of this unique culture: pottery, stone and metal objects as well as sanctuaries, funerary monuments and wall paintings discovered in houses and palaces. The museum’s collection covers a time span of over 5500 years. 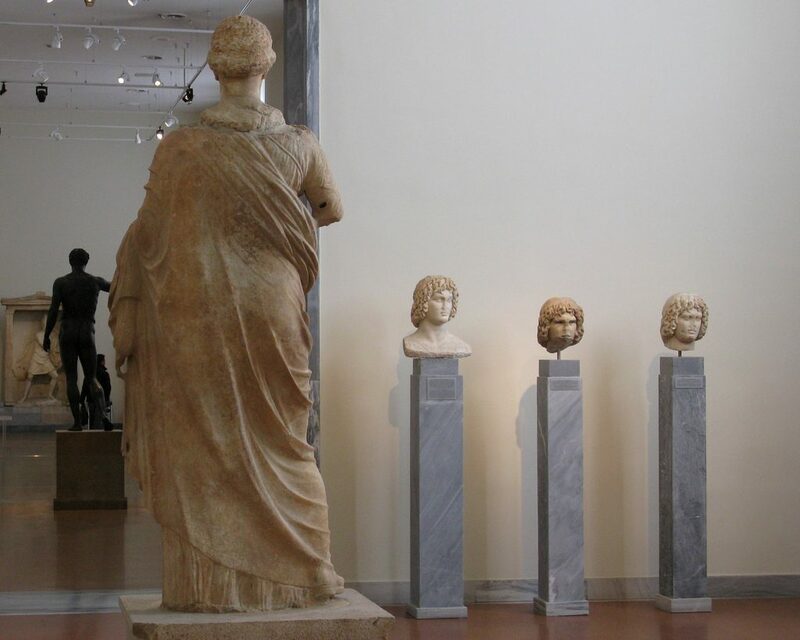 An excellent museum to see some beautiful examples of ancient classical art, the Archaeological Museum of Olympia, located on the archaeological site of ancient Olympia (where the Olympic Games were born) is a pleasant space where you can wander all afternoon. 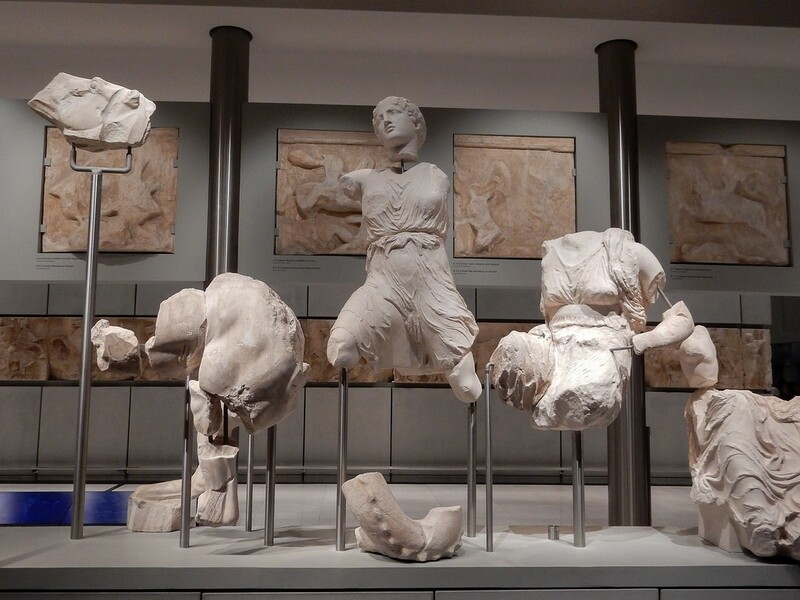 The sculpture exhibit is particularly interesting, and includes the magnificent Hermes of Praxiteles, as well as many of the sculptures found on the archaeological site, including the Temple of Zeus’ metopes. While the National Museum of Contemporary Art (EMST) opened in 2000, it’s only since 2016 that it’s been in the renovated building of the Fix factory in central Athens. The permanent collection comprises works of local and foreign artists, such as Chryssa, Nikos Kessanlis, Jannis Kounellis, Stephen Antonakos, Mona Hatoun, Gary Hill, Emily Jacir, Ilya and Emilia Kabakov. However, it has not been made available for public viewing yet, as the museum is only partially open. It does host a plethora of exhibitions and events, however, and offers a space for contemporary Greek and foreign artists.